1912: The Esplanade was constructed as twelve upscale townhomes and flats in an Arts & Crafts style. A variety of floor plans were available in 1, 2, and 3 story arrangements. Each boasted leaded art glass interior doors, windows, and private entrances. Also included were gas fireplaces, central steam heat, and sitting porches. 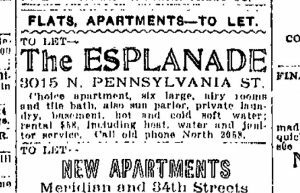 To LET: Esplanade Apartments, new, 3015 North Pennsylvania Street; six and seven rooms, strictly modern; $57 to $65; beautiful interior and exterior; fine surroundings; ready for occupancy about Sept. 15; steam heated garages extra. Call on premises. Note that $65 a month was substantially more than a month’s pay for most people at the time. October 1915 Indianapolis Star article concerning Hostile Aeroplanes – Enjoy! The 1960s: As with many older homes and apartments, The Esplanade fell on hard times throughout the 1960s and 1970s. The apartments were chopped into smaller units and efficiencies with little attention to maintenance and repair. The 1980s: In 1983 The Esplanade was individually listed on the National Register of Historic Places and a grand renovation project commenced that proceeded to tear away decades of neglect. The entire building was gutted to the framing with plans for new plumbing, wiring, fire sprinkler systems, and luxurious accommodations. Each unit was to receive individual heating & air conditioning systems, hot water heaters, etc., and preservation of the historic character; all the things needed to bring the building into the 21st century and place The Esplanade back on the map. However, once again, The Esplanade suffered a sad fate. The company performing the restoration work went bankrupt and the project was never completed. Worked stopped in 1987 and the building sat empty for nearly five years. Van Rooy Properties then took ownership and finished 10 nearly completed units and had plans to begin work on the remaining 12 still gutted units; a project never completed. 2005: Carmer Watson Properties, Inc. purchased the building in June 2005. The Esplanade’s unique architecture and home like qualities met our requirements for what has become an owner occupied, managed, and maintained building. 2012: The Esplanade Turns 100! (from historicmeridianpark.org) In 1912, the city of Indianapolis hadn’t spread much north of Fall Creek so when construction began on the Esplanade Apartments located at 30th and Pennsylvania St. there were not many neighbors close. A brief stroll down Pennsylvania St. today reveals a much different landscape. Unlike in the early 20th century, every acre is filled with homes or businesses and after 100 years, the Esplanade Apartments still stands as a premier place to live in HMP. 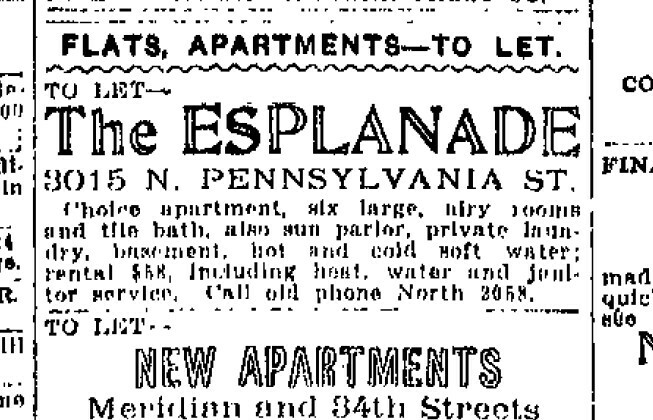 The Esplanade began as a 12-unit luxury apartment building with steam heat, art glass windows, hardwood floors, and automobile garages for rent. Although the horseless carriage hadn’t been around long, but the builder used good foresight when he decided to include garages as part of the Esplanade. Esplanade units rented for $57.00 to $65.00 a month. For a few dollars more per month a tenant could rent a heated garage. The Esplanade and homes in the HMP neighborhood were the premier places to live. During the 1960’s many people began moving to the suburbs. This flight from the urban neighborhoods ushered in a new era for “inner city” neighborhoods –one marked with housing decline and crime. Moreover, during this same time, the rental market was evolving. Renters were looking for smaller and more affordable places to live. As a result of this rental trend, most of the Esplanade’s apartments were divided to create multiple units out of one unit. For the next 20 or more years the neighborhood and the Esplanade were in decline. As with most neighborhoods, the pendulum began to swing in the other direction and people began to see the value of living further in the city. During the early 80’s, a renewal began all over Indianapolis. The newly formed “Historic Meridian Park Neighborhood Association” helped transform the HMP area back to its original glory. The Esplanade was still rundown and neglected to the point that some people had given up and wanted to tear it down, however, the good people of HMP saw the potential of the Esplanade and worked to save it from the wrecking ball. After countless hours of hard work, the Esplanade was listed on the National Register of Historic Places in 1983. In 1986 the owner of the Acquisition and Restoration Corporation, Scott Keller, decided to restore the Esplanade back to its former glory. With so many years of neglect and poor maintenance, the project looked daunting. However, Scott Keller was not discouraged. He gutted the Esplanade and began restoring its beauty. Unfortunately it was short lived, and in 1987 the Acquisition and Restoration Corp. went bankrupt. All work stopped and the Esplanade sat vacant for over four years. In 1991 the Van Rooy Company purchased the Esplanade. However, Van Rooy only completed six units in the main building and created four newly formed apartments in the carriage house. This left eight of the original units stripped and gutted. Finally, in 2005, the owners of Carmer Watson Properties were looking for an investment property in Indianapolis and a place they could call home. At the ripe old age of 93, the Esplanade’s distinctive lines, sharply pitched roofs and quaint front porches were calling to them to make it their home. Restoring the Esplanade required tireless hours of dedication and attention to detail. The owners were not discouraged and today the Esplanade now stands as an anchor to the Southwest entrance to Historic Meridian Park. Tenants once again fill the walls with the sounds of laughter and community spirit. With continued love and care, the Esplanade will stand tall in this community for many more years to come. Thanks to all that have made it possible. Happy 100 years to the ESPLANADE!